but on further investigation I have discovered that the latest definitions are being installed successfully (according to the SEP client event viewer) – but are not displaying in the SEP client UI. 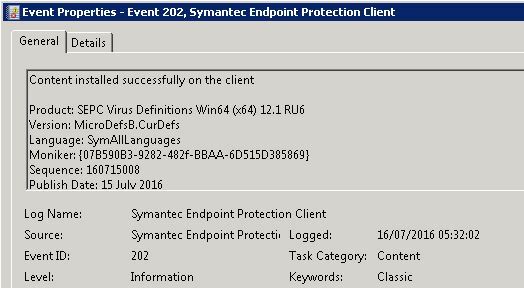 It turns out that the scheduled weekly scans do not finish which is impacting the latest definitions being applied to the Symantec Endpoint Protection client. At the moment the only way I can see around this is to either try and stop the scan or restart the server. The later is not the ideal solution as I don’t want to have to restart systems that are in a production environment and I really don’t want to be restarting these systems every week. I was wondering if anyone else out there was experiencing similar issues with the SEP 12.1.6 client? This article is a work in progress as I want to find a permanent, non-disruptive solution. If anyone has experienced something similar and has ideas for solutions I would love to hear from you.